The house is finished and ready to rent! We already have 6 weeks worth of bookings so far, which is very exciting for our first year. Tom has been back to the house a few times to meet with Sawdays and Gite de France to discuss our ratings and advertising. We have also added a balustrade to the terrace. We felt that the drop was just a little too high. Tom designed it to match the house and we found a great local guy called Chris to build it for us. Despite this not being something we wanted but realised that we needed, we feel that it has turned out really well and Chris did a great job. As you can see from the image above the grass is doing nicely. It still has a little bit of growing to do and we need to tidy up the posts that can be seen, but there will definitely be a useable garden space in time for our first guests. There is also still some planting to do and I think at the front of the house we will go with lavender. The purple of the lavender and the cream of the stone will always be a winning combination! We had the trees at the front of the house pollarded. Whenn they grow back they will have a much thicker look and give the house some more privacy from the road. Chris also did a lot of the snagging works inside the house. We know have wardrobes in all the rooms and the architraves and skirting have been finished. It is amazing what a difference these little touches make to the house. We will be back in the Summer and I for one can’t wait. It will be almost a year since I was last there and so much has changed. If you are interested in renting the house, please visit our website where there are a lot more photos and information about the house. Categories: House Construction, Internals, Landscaping, Terracing | Tags: Grass, Landscaping, Montemboeuf, Montemboeuf Plot | Permalink. Categories: French House Build, House Construction, Interiors, Internals, kitchen, Landscaping | Tags: Landscaping, Mairie Montemboeuf, Montemboeuf | Permalink. 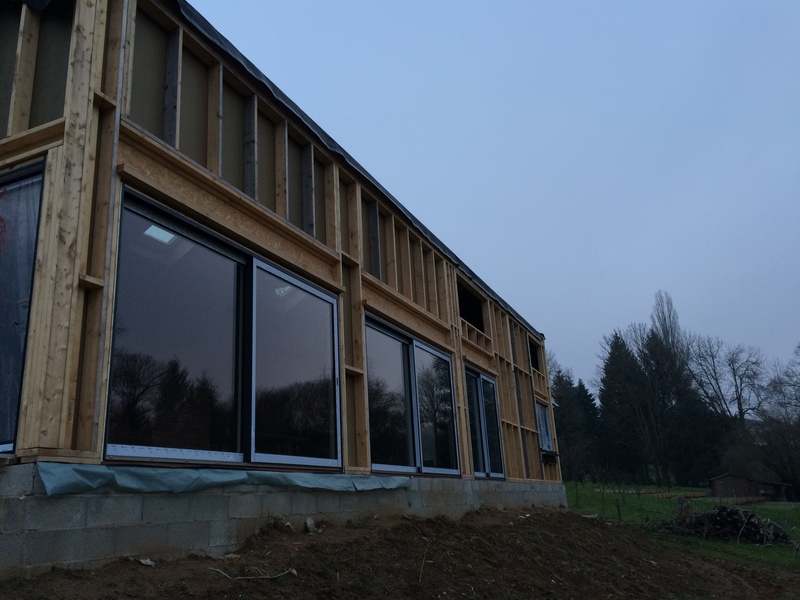 Here we are in France, 3 weeks of putting the (hopefully) finishing touches to the house. So much had happened since I last the house that I was very excited to see it. The week before we were there, my sister and her family stayed for a week. They had to do a bit of indoor camping because unfortunately the kitchen hadn’t been fitted in time for their arrival. I hope they still enjoyed themselves though – at least they were able to have a hot shower! Sadly for them, the kitchen started to go in just as they were about to leave and was ready to use by the time that we arrived. The kitchen may be have been delayed, but it is well worth the wait. It is much nicer than the kitchen we have at home and is great fun to use. We were lucky to find our kitchen fitter because he was able to help out with a lot of the other jobs that we needed to do. There was no way that we would have been able to work on the flooring, skirting, wall cladding and other bits and bobs if he hadn’t helped us out. We are very grateful to Matt for all his hard work. Checking the screws are tight enough! During our first week, Tom spent a lot of time fixing lighting in the rooms. It is all well and good having a shower or going to the loo with the door open when it is just the two of you, but when there are a lot of builders around, it is a good idea to have the door shut! My DIY skills amount to painting and fixing towel rails and it was a little too early for that, so I was on Supermarket runs and Lego building with Molly. Neither of these things are particular hardships, although letting me loose in a French supermarket may not necessarily be the best idea. I was able to help Tom with the storage for the living area. He had worked this all out very precisely on IKEAs design page which then kindly gave him a list of all the bits he needed. All of this was included on his mammoth ‘three trolley’ trip to Bordeaux IKEA, but something went wrong and a few bits were missing and a few bits were left over (a door rather than the vital screw we had forgotten to use). Off we popped to IKEA once again, but got round in record time and didn’t even stop for meatballs. We also went to the Mairie to talk about bins and rubbish collections. I know that even though the translation of Mairie is Mayor, he isn’t the same as our Mayor in Lewisham, I still found it funny that we had to talk to him about our bins when at home residents have to ring a big call centre in a Council building somewhere. I work in the same office as the people whose role includes dealing with problems of missed collections and missing bins and I know that they like me would find it amusing. I can never imagine a situation where Tom and I would walk in to Lewisham’s Town Council Chambers to talk to the Mayor about getting a bin. We have just started the second week and things have moved on massively. It was a flurry of excitement and activity here on Monday (yesterday). Thromas – our plumbers and electricians – came to install shower screens, heated towel rails and some of the lighting. This was the lighting that needed scaffolding to install so Tom wasn’t able to do it. It is amazing what a bit of lighting can do to a room. With these major jobs done there would be a lot less dust being created. This meant we could put furniture together and remove plastic coverings from the windows – the later of these activities certainly made the place feel a little less like a building site. Flapping plastic in never a good look. With the furniture in place we were finally one the way to having a home. On Thursday, Fred (French Fred), the man doing our earthworks is starting. Hopefully, by the middle of next week we will have a driveway, footpath and some useable garden at the back of the house. This will make a huge difference to the look of the house. Removing plastic from the windows does help stopping the place look like a building site, but the piles of earth and stone all over the place do nothing for the look of the house. I’m off to do some more cleaning now, we’ve got guests coming in a couple of days, so we need to get things a little more tidy – I think you put up with a lot more when you’ve been living with it for a while. I’ll report back soon on our progress…., but it really is all coming together….! Categories: bathrooms, House Construction, Interiors, Internals, kitchen, Marandat | Tags: Lighting, Mairie Montemboeuf | Permalink. As the wall was going up on the outside, on the inside work started on the painting the walls on the inside. First things first, the whole are had to be sanded to make the surface ready to paint. The poor chap above was given this task and it looks like he did it on a very warm day. Luckily he still seemed to have a smile on his face! I will not post lots of photos of paint drying, but it is an important step in the build process, so in needed blogging about! We still haven’t quite decided on all the colours, but we are getting there. We even roped in our neighbours and lodger to help us choose our colours, but we only got as far as the grey and orange! We do not have that long to decide because our decorator needs to order the paint from the UK. Paint colours are quite important for the feel and look of the house, so although we don’t have long, ew can’t rush these things either…. The thing about finding songs to match the title of the blog post, or vise versa is that you come across some crackers (and some not so much). I will leave you to decide which this is. Categories: Interiors, Internals, Montemboeuf Plot | Tags: Decoration, Painting, SLM construction | Permalink. Look through any window, yeah What do you see? 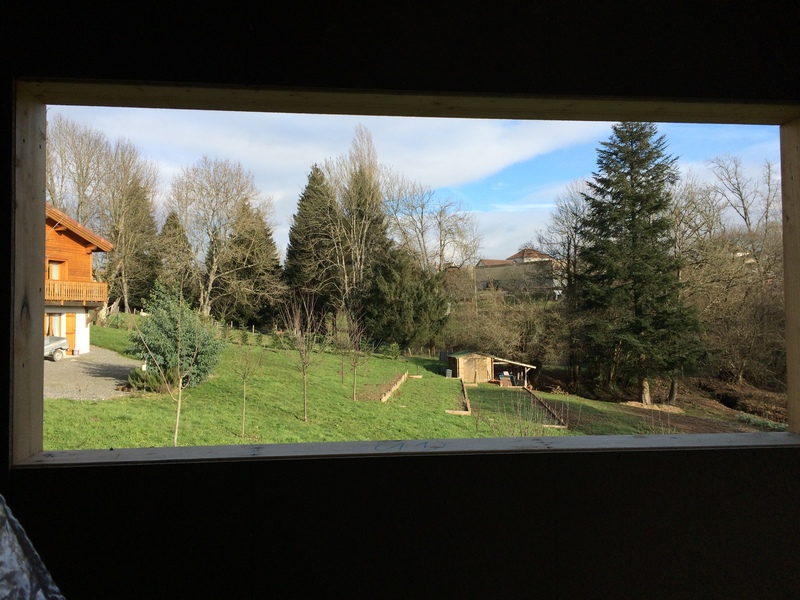 – Regardez dans n’importe quelle fenêtre, qu’est-ce que tu voir? A lovely view hopefully! It was a big week this week on site with a lot happening. 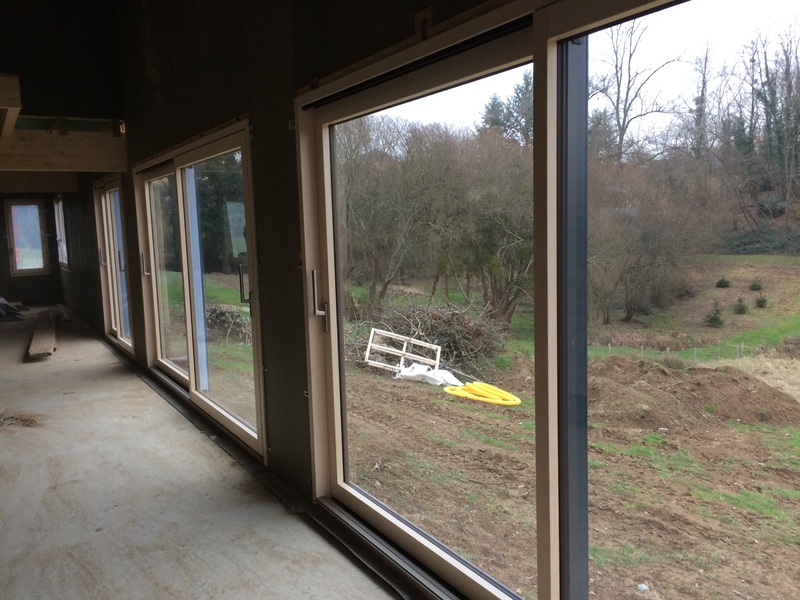 Our 3 Velux windows were installed, the ‘crinkly tin’ finally started going up, flooring went down upstairs and the big sliding doors in the living room also went in. With flooring down upstairs I was finally able to go up and have a look myself. I am not a lover of heights and ladders at the best of times so the thought of wandering around up there, balancing on timber beams was not my idea of fun! 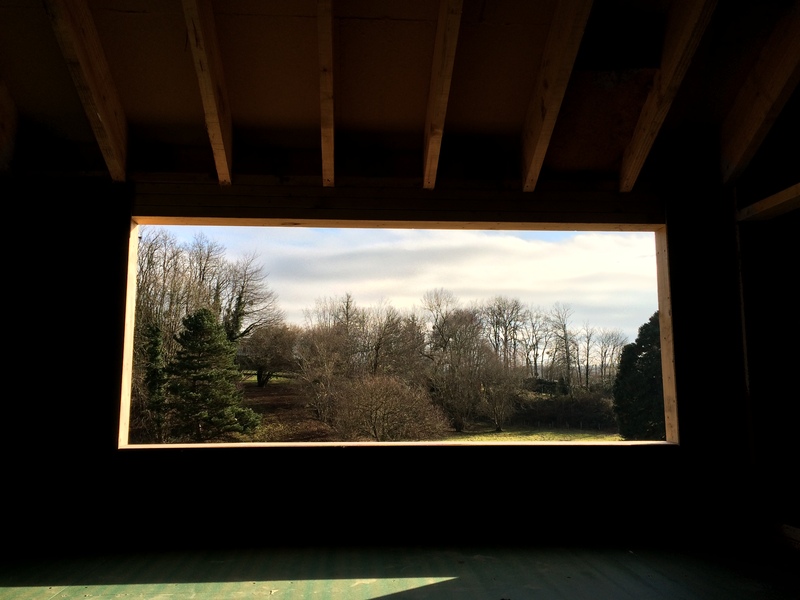 View from master bathroom, before the windows went in! Anyway, now I have been up there, I was really able to appreciate the views across to the other side of the plot. It wasn’t the best of days to see it from, but I can just imagine lying in bed with the sunshine streaming in – bliss! As I mentioned in our last post, we thought we should celebrate the closing of the roof. So on, Thursday, we took some champagne along with us to site and raised a glass to all our builders. Drinking champagne on a building site, in the cold on a Thursday afternoon is not something I ever thought I’d do. I think the builders appreciated it anyway and even complimented us on our choice of champagne! Now if a Frenchman compliments you on your champagne choice, then you must be doing something right. There are still a couple of windows to fit upstairs, but even with the downstairs windows fitted the difference in the temperature in the house is very noticeable. We also no longer have the wind howling through which makes being on site a lot more pleasant. Hopefully, the windows will be complete on Monday and then work can continue on the roof. Unfortunately, a lot of rain is forecast for next week and rather unsurprisingly the builders can’t work on fitting a metal roof when it is wet! Another important stage was that we were connected to mains drainage! The Mairie has been promising this for a while, and in the end they came a day earlier than we were expecting! We now have water, drainage and electricity – we could almost move in. Categories: French builders, House Construction, Interiors, Internals, Marandat, Montemboeuf Plot | Tags: Drainage, Flooring, interiors, topping out, Velux, Velux windows, Windows | Permalink. We’ve been kitchen hunting in France and for some people (as you can tell from the photo above) it was more exciting than others. 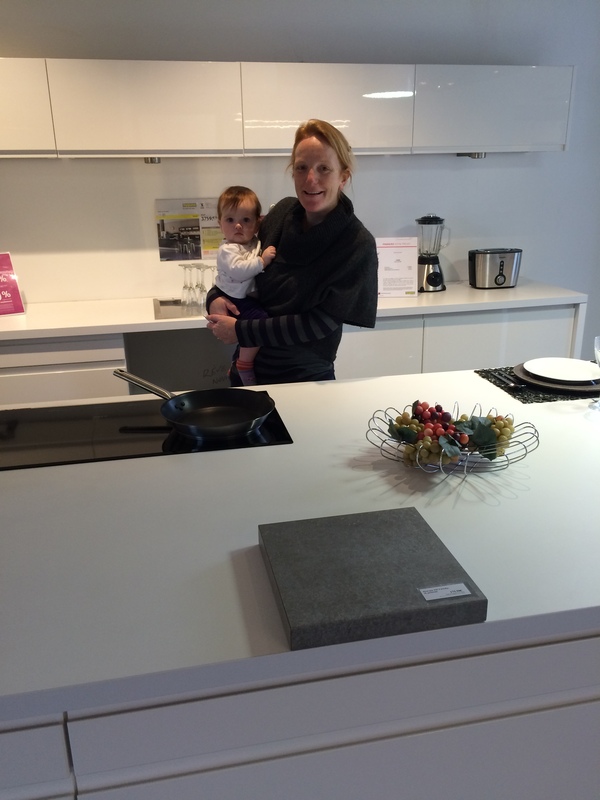 Wandering around kitchen showrooms, it is very hard to keep in mind that we will not necessarily be living in this house and it is very easy to get swayed by the shiny taps (again) and gloss white cupboards with the soft-close hinges. I have to remind myself that we can’t go for a very high end kitchen (but soft close hinges would be nice). It seems, however, we have been looking at kitchens at the right time of year because there are a lot of bargains to be had. 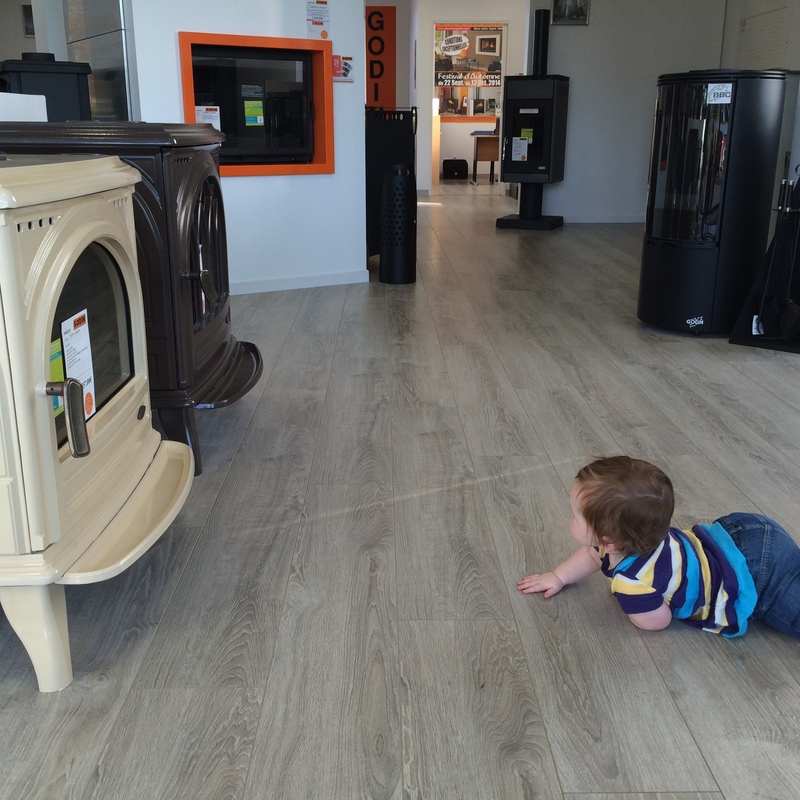 So much so, that we actually bought one…..yes reader, we bought one- and it had soft close hinges. It will be delivered in April 2015, I just hope there is a house built to put it in. 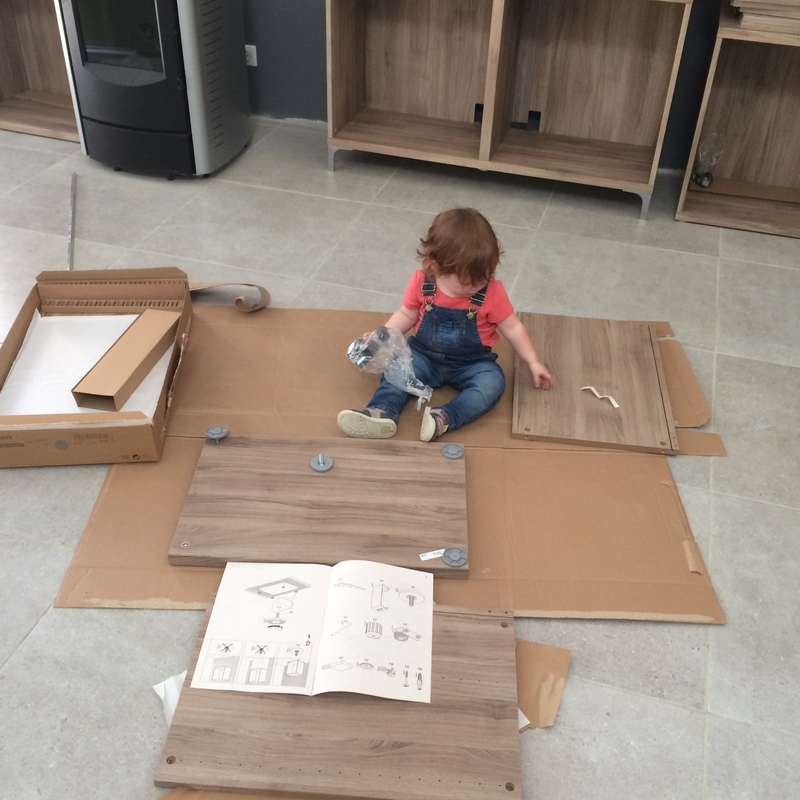 I think we will be putting the kitchen together ourselves, so if anyone fancies a holiday in France putting together flat pack furniture, just let me know. Hopefully, the kitchen will be so nice that people will want to spend time in it, at parties or otherwise. Categories: Interiors, Internals, Montemboeuf Plot | Tags: interiors, Jona Lewie, kitchen showrooms, kitchens | Permalink. It’s hard choosing the right poêle! Tom, Molly and I have spent a happy couple of days looking at interiors for the house. This has included a trip to Leroy Merlin, Godin to look at poêles, Cedeo for bathrooms and Cuisinella to look at kitchens. These were the jobs that I had been looking forward to and it was great fun. As I have mentioned before, it was very hard not to get carried away when looking at shiny tiles and sparkly taps. It was very a useful exercise to get a better idea of how what we would like fits in with out budget and where we can save money to get the items that are more important to us. As Tom has designed the house, my responsibility lies with running and checking the budget (remember excel is you friend). Tom and Molly checking out tiles. To laminate or not to laminate? How much for a shower screen? Not sure Molly’s taste in poêles is the same as ours! I have asked a few people about what they would expect to see in a luxury bathroom and double sinks seemed to come up every time. Fortunately, Tom has designed the master bathroom large enough to fit one in, so those of you that suggested may be in luck! We also looked at baths a showers that squirt jets of water at you, something I think is quite fun, but sadly I don’t think I can persuade Tom of their benefits! We then went to Marandat to see our house being built. It was very exciting to see the guys working on our walls and windows. 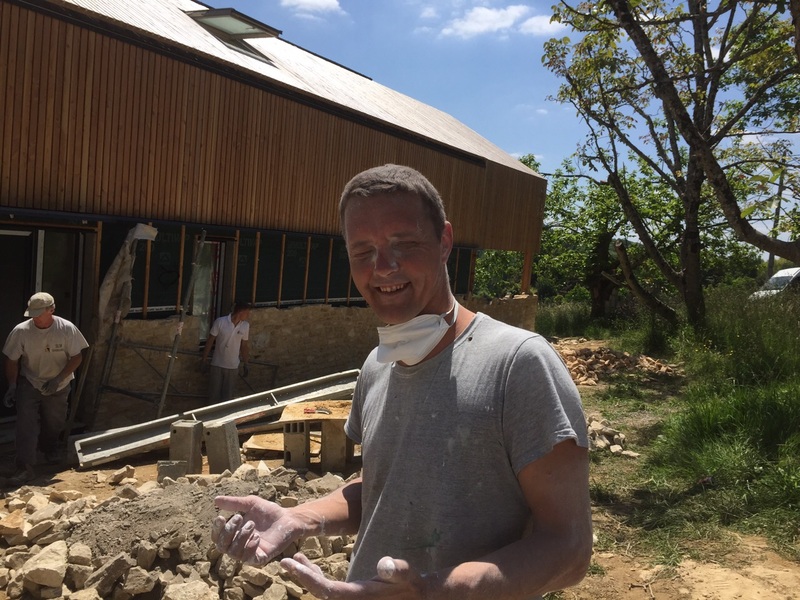 They still hope to start on site next week which is when Tom will be back in the UK, so I really am going to have to gen up on my French building terms. At least I know the words for build, timber, wood and stop! Tom has also been contacting plumbers, electricians, tree surgeons and we have arranged for our mains drainage to be connected! It is about to start to get very busy on site….. Categories: Construction, House Construction, Internals, Marandat, Timber Frame | Tags: bathrooms, interiors, kitchens, Leroy Merlin, Mairie Montemboeuf, Marandat | Permalink.